Capital One has rolled out several new business credit card offers – and they’re quite impressive. This week, we take a look at a few of those business offers that will “spark” your interest, especially if you’re a small business owner. The latest offering, Capital One Spark, has a lot to offer. We especially like the convenience of online account services. Of course, that’s not necessarily anything new, but it’s the way Capital One keeps up with the latest in technology in an effort to provide a “total package” to its customers. You can manage your account with tools such as activity alerts on your cell phone or mobile device, quick online payment options and easy access to up to 13 months of your past account statements. Downloading them is a breeze, too. 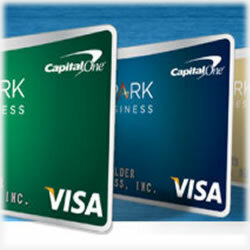 Capital One is known for its focus on security. Its team monitors accounts around the clock and you’re quickly notified if any transaction appears questionable. While some business card offers charge for additional cards, no worries with Capital One Spark. You can add up to 25 additional cards to your account with no extra costs. Each one can be customized, too, with individual spending limits for each employee. Have their purchases itemized on your statement for easy recordkeeping. This will make your accountant happy: An easy to read year end summary is provided for your convenience. It’s an itemized report of your company’s annual spending and is a powerful tool for tracking business expenses. Tax season has never been easier. Like the idea of your business logo on your credit card? You can do it easily with the simple Image Card online service. It’s a complimentary service that really lets you take advantage of a golden marketing opportunity. The Capital One Spark Miles Business Credit Card allows you to earn 2 miles per every dollar you spend. Plus, you receive 10,000 bonus miles when you spend $1,000 during your first three months of opening the account. And those business cards we mentioned? Request at least one and you get an additional 5,000 bonus miles. No annual fee the first year ($59 for every year after that) sweetens the deal even more. It’s ideal for businesses of all sizes. The Capital One Spark Miles Select for Business offers a lot of the same perks its counterpart brings to the table. You’ll get a 50% bonus on all the cash back you earn every calendar year with 1% cash back on every purchase, every single day. This offer differs in the annual fee: there is none. Claim your year end summaries (and you can also get online quarterly summaries, too) and with no limitations on how many miles you earn and the fact they don’t expire makes this an all-around great consideration. Also, there’s a 0% intro APR until may, 2012. Note: balance transfers aren’t allowed with this offer. No worries if your business card is lost or stolen. With a $0 fraud liability, you never have to worry about fraudulent charges. And if you travel a lot, you’ll love the benefits for travelers. The Capital One “Auto Rental Collision Damage Waiver Program” covers any collisions, damages or losses if you charge it with your Capital One card. Plus, enjoy discounts at some of the best hotels across the country. Travel and Emergency Assistance kicks in when you’re traveling for business. Rely on a wide range of emergency services including ticket replacement, legal or medical referrals, and more – around the clock, throughout the year. Just in time for the holidays, buying gifts for your staff is protected with the Capital One Purchase Security and Extended Protection. It’s an automatic protection on most of the purchases you make with your business credit card and covers you for 90 days in the event of loss, theft, damage, or fire. Like to dine out? Be sure to enroll in the program so that you can enjoy dining discounts. You’re sure to be impressed with the substantial discounts at restaurants around the world. As you can see, Capital One has really covered the bases well with its new credit card offers. Spark offers something for all businesses of any sizes. Whether you just celebrated your grand opening or have an established business for generations, this might be the right business credit card that more than meets your needs.